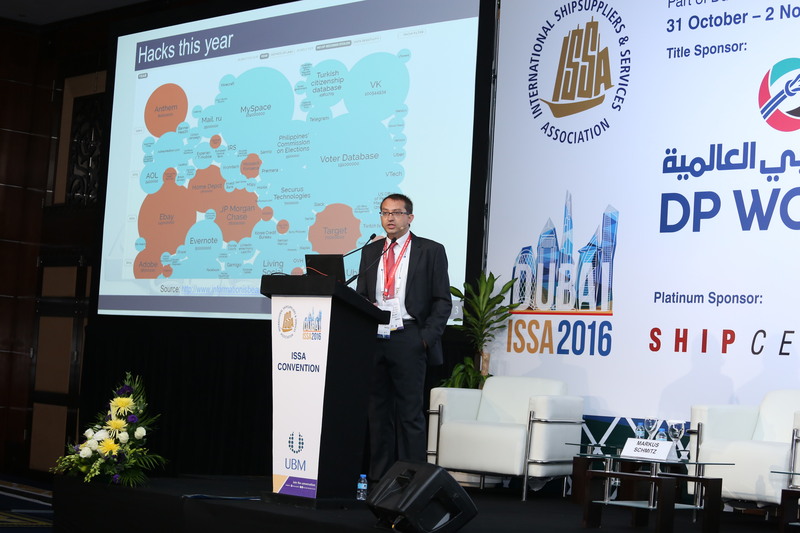 2nd October 2016 Dubai – Markus Schmitz Managing Director and Lee Williamson Principal Consultant – SOFTimpact representing Intermanager, jointly presented at the International Ship Suppliers conference on the Cybersecurity topic. Markus spoke about the current threats facing Maritime and how these could effect ship suppliers. This was aptly demonstrated when some of the audience realized their business cards given out had been used to send “fake” emails between them. This was followed up by a dual screen demo showing a well known international banks online banking system on Markus screen, while Lee showed the “hackers” perspective. This allowed the audience to see how easily wifi could be manipulated by a skilled professional to take control of their web traffic and in doing so capture sensitive information such as banking username and password. Our sincere thanks to you and Markus for a brilliant Presentation. People have not stopped talking about it and if ever a wake-up call was delivered and well received this was it. It was also fantastic that Markus extolled the virtues of the close relationship which ISSA enjoys with Intermanager.